Remember me? I’m your official sandwich taster. I’m back and talking about a few more of the best sandwiches in Hendricks County. In case you missed Part One, The Hendricks County Convention and Visitors Bureau posed a question to its Facebook page — “What’s your favorite sandwich in Hendricks County?” Since it’s getting colder outside…I decided to shake things up a bit and go for hearty and hot sandwiches at two of Hendricks County’s most popular independent restaurants. A friend of mine who is a longtime fan of this local hot spot recommended this sandwich that is served with a side (such as coleslaw, cottage cheese, red bean salad, potato salad, fries and more). 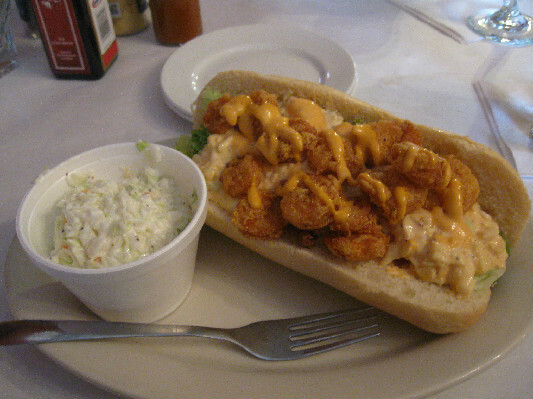 The sandwich itself includes deep-fried shrimp, lettuce and tomatoes, stuffed into a hearty roll, filled with a spicy remoulade coleslaw mix. You’ll need a few extra napkins, because it’s a messy sandwich — but so worth every bite. I ordered mine with a side of homemade coleslaw (yep, I do love coleslaw). Price: $7 (includes a side). Where: Frank & Mary&apos;s, 21 E. Main St. (U.S. 136), Pittsboro; Phone: (317) 892-3485. Tip: This spicy sandwich delivers a nice Louisiana bite and is plenty to share. I also loved the homemade coleslaw. Bonus Tip: Frank & Mary’s is family-friendly restaurant, with a large menu which includes items such as their famous catfish, burgers and more. This was my first visit to Frank & Mary’s, and I loved the food and charm of this tavern-style restaurant. I also tried an order of homemade potato skins and highly recommend them as well! Some of the other sandwiches on the menu: Po Boy Catfish sandwich, Cod sandwich, Tilapia sandwich, Focaccia Muffaletta. I do love a classic sandwich, so when I got this suggestion from a Brownsburg resident, I had to give it a try. Let me tell you, this one didn’t disappoint: a juicy grilled burger, topped with melted cheese, grilled onions and served up on Texas toast-style grilled bread. I ordered mine with a side of homemade potato salad. Price: $9.25 (includes a side) Where: Green Street Pub and Eatery, 911 N. Green Street, Brownsburg; Phone (317) 852-6644. 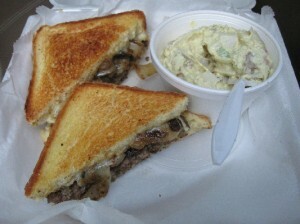 Tip: For me, it doesn&apos;t get much better than a Patty Melt sandwich, and this is one of my faves. This sandwich is plenty for two, should you want to split and appetizer or try out one of the salads on the menu. Bonus Tips: For adults who need a place to watch a game, Green Street has a large bar area with several TVs. You’ll find a full menu with steaks, seafood and pasta. Green Street is family-friendly and has a children’s menu. Some of the other sandwiches on the menu: Jumbo Pork Tenderloin sandwich, Portabella Mushroom sandwich, Classic Burger. I know I have so many more sandwiches to taste. Here are a few more of your recommendations: Bailey&apos;s Jury Room - Tenderloin sandwich City BBQ - Smoked Turkey Breast sandwich Clayton Cafe - Tenderloin sandwich The Coachman Restaurant and Lounge - Grouper sandwich Court House Grounds– BLT sandwich Mayberry Cafe - Tenderloin sandwich Perillo&apos;s Pizzeria - Strombolis and Calzones Is there a sandwich missing from the list? Please drop me a line in the comments section below, or you can leave a comment on the HCCVB Facebook page.